I suppose it should bee no surprise that Suicide Squad and the Superman storyline from Action Comics are working towards a crossover. Amanda Waller did recruit General Zod for her band of unhappy operatives a while ago. Sooner or later this had to come together. This is a very grisly and intense issue. Zod uses his heat vision to cut into his own brain and remove the bomb that Waller had had implanted. 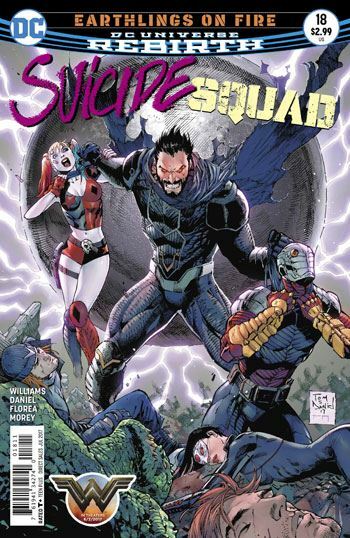 Once free, he is out to exact revenge on her, and the Suicide Squad members find themselves hopelessly outgunned. There are a few bright spots along the way. Harley Quinn and Rick Flag have some enjoyable repartee, and Captain Boomerang manages to steal the show, if only for one disgusting scene. Astoundingly, it seems this was the one eventuality that Amanda Waller did not foresee or prepare for. I’m so used to her pulling an Ace out of a hole, but that just doesn’t happen this time around. We find out what the Black Vault truly is, and Zod puts its to devastating use. 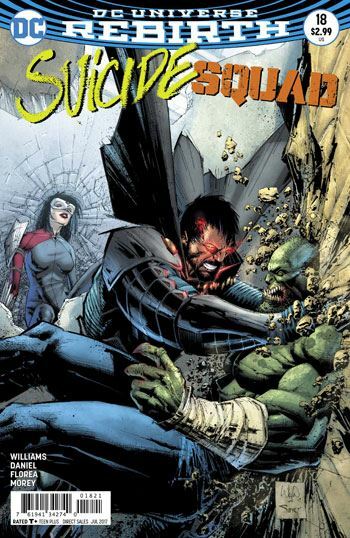 Other effects of the Black Vault appear in this week’s issue of Action Comics, and the two books converge in their conclusion. The issue feels really fast. I was surprised that I hit the end when I did. That’s not such a bad thing, really. The issue never had a dull moment. And it’s very clear that this is spinning into something completely out of the Squad’s control.